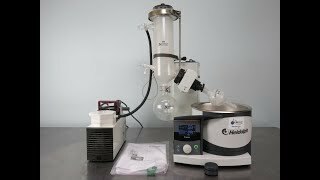 The Heidolph Hei-VAP Advantage Rotary Evaporator provides you with easy to operate, digital control over the evaporation process with integral safe guards and features. This rotavapor uses maintenance free non sparking motors, and a durable PTFE vacuum seal to help keep costs down and the G5 Glassware set with dry ice condenser for low-boiling solvents. This digital rotavapor features a large, easy to read 3.5” LCD display, shows users all their parameters including current rotation speed, bath temperature and can been seen at a distance. The operating panel of this digital rotavapor is also detachable making it a great choice for operating from outside of closed fume hood. This rotary evaporator provides peace of mind by shutting off the evaporator system when the desired time has elapsed and lifts the flask from the bath. The Hei-Vap advantage features two independent circuits that automatically shut off heating if the temperature overshoots by 5°C and if your water bath runs dry. This Heidolph Hei-VAP Advantage Rotary Evaporator has been fully inspected and is operating to expectations. All of our lab equipment comes backed with our standard warranty. Should you have any questions, please don't hesitate to contact us.